Myotonic dystrophy (DM) is the most common form of genetic muscular dystrophy that begins in adulthood. DM is characterized by progressive muscle wasting and weakness. People with this disorder often have prolonged muscle contractions (myotonic) and are not able to relax certain muscles after use. DM has genetically distinct type 1 (DM1) and type 2 (DM2), caused by a toxic gain of function of expanded CUG and CCUG nucleotide repeats, respectively. Nucleotides are organic molecules that serve as the building blocks for forming the genetic material DNA and RNA. Although both disorders are clinically similar, congenital DM (CDM), a severe DM form, is found only in DM1. Notably, CDM – as the name implies – is found only in early life, suggesting specific pathological mechanisms. However, the mechanisms remain largely unexplained. 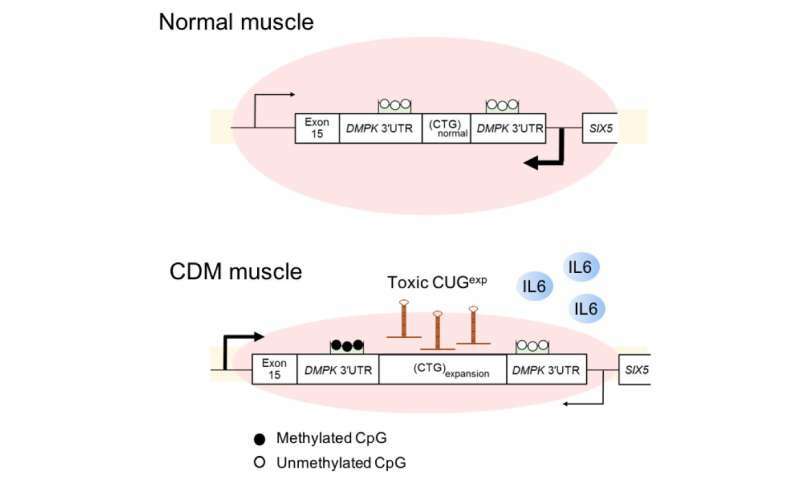 "We ponder why only expanded CTG repeats in the DMPK and not CCTG repeats in the CNBP gene result in CDM, and how highly methylated CpG sites around the expanded repeats contribute to the disease process, and what causes severe muscle immaturity in CDM," Masayuki Nakamori, lead author of an Osaka University-centered study that investigated the specific mechanisms responsible for CDM explains. To address the questions, the research team performed a comprehensive study dissecting the histology, repeat size, CpG methylation, alternative splicing, and gene expression of CDM skeletal muscles and cell models. They found an upregulation of the interleukin-6 (IL-6) myokine signaling pathway in CDM muscles, and a correlation between muscle immaturity with IL-6 expression. Myokines are essentially cytokines (important small proteins responsible for cell signaling) that are produced and released by muscle cells (myocytes) in response to muscular contractions. Because the IL-6 pathway is involved in both myocyte maturation and muscle degeneration, the results indicate that enhanced RNA toxicity contributes to severe CDM phenotypes through aberrant IL-6 signaling. The findings were recently published in Cell Reports. "The disease process of CDM has yet to be elucidated because of the difficulty of obtaining enough and appropriate muscle samples for analysis," says co-author Hideki Mochizuki. "In this study, despite the limitation, we successfully obtained ten CDM samples from identical muscles in different patients of similar age. This allows us to investigate the specific pathomechanisms of CDM, which yielded results that support the possibility of treatment for CDM through interventions in IL-6 (the NF-kB) signaling pathways, which have been applied successfully for other diseases, including rheumatoid arthritis."